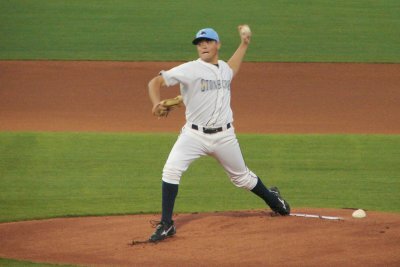 The Charlotte Stone Crabs defeated the Clearwater Threshers 3-1 on Tuesday night to earn a sweep of the four game series. The win was the Stone Crabs fifth in a row and has moved them into first place of the division after Bradenton lost both games of their doubleheader. Clearwater sent the National League Rookie of the Year JA Happ to the mound for the final game, but was still unable to keep the Stone Crab offense off the board. Happ who is with the Threshers on a MLB rehab assignment pitched three innings in the game and surrendered two runs to the Charlotte offense. The Stone Crabs took the lead in the second inning. Stephen Vogt struck a double to left field then later scored on a ground ball by Michael Sheridan to give them a 1-0 lead. Charlotte posted another run an inning later. Tim Beckham doubled with two outs to put a runner in scoring position. Then Greg Sexton singled to left, scoring Beckham and increasing the lead to 2-0. Clearwater got on the scoreboard in the fourth inning. Derrick Mitchell led of the inning with a double to left. Mitchell would later score on a wild pitch to cut the lead in half 2-1. But the Stone Crabs countered the run in the bottom of the fourth. Jake Jefferies singled on a line drive to center then scored on an RBI double by Omar Luna. Neither club would push across another run and the Stone Crabs were victorious 3-1. Matt Moore earned his first victory of 2010 by pinching 6 1/3 innings allowing just 1 run on 4 hits with 4 strikeouts and 3 walks. Marquis Fleming threw 1 2/3 innings of scoreless relief allowing 2 hits with 3 strikeouts and a walk. Zach Quate recorded his ninth save with perfect ninth inning, striking out 1 in the process. The first place Stone Crabs hit the road for a three game set against the Palm Beach Cardinals at Roger Dean Stadium. The clubs are set to play a doubleheader on Wednesday. Shane Dyer (2-1, 1.07) will pitch against Scott McGregor (3-3, 2.80) in game one while it will be Nick Barnese (4-3, 3.88) versus Jared Bradford (2-3, 7.24) in game two of the twin seven inning contests.